The fabulous Denise Hotel is on Zakynthos Island in Lagana, one of the most popular family and couples holiday destinations in Greece. Located on Laganas Beach, one of the most beautiful beaches of Zakynthos, it is suitable for families, young couples and groups of friends seeking good quality accommodation in a coastal area with a sublime view. This beautiful beach is known for its reproduction shelter for the sea turtle Caretta-Caretta. During the day, you may find some difficulty in deciding what to do first: to bask in the sun next to the swimming pool, to marvel at the views of the ocean or, visit the seaside tavern where you can savour Greek traditional dishes. There is a great beach bar for the evenings where you can relax while you are being cooled by the breeze. The guest rooms are charming. The Denise Hotel is one not to be missed – book it now and rest assured you will have a holiday to remember. Getting to the hotel: By ferry from the mainland or the Islands airport which is just a kilometre from Lagana. Local Tips: The sea here is appropriate for children to swim in because of its shallowness (there are shallow waters all the way along an about 100-metre distance from the coast). 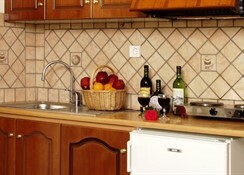 The hotel is just 200 metres from local shops, bars and restaurants. 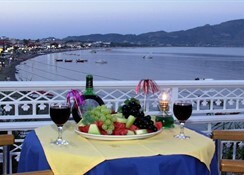 Food, drink and entertainment: Beach bar, pool bar with satellite TV, restaurant, garden, sitting room. 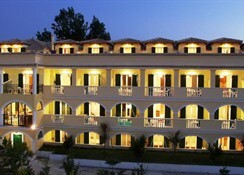 Sport, games and activities: Swimming pool, games room and verandas with sunbathing lounge chairs. For the kids: Swimming pool and playground. Additional: Reception, Internet Service, Elevator, Credit cards accepted, currency exchange, rent a car, safe box, wake up service, excursions – tours including horse-riding, diving and car-hire. 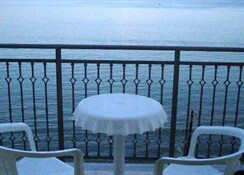 The complex offers studios and apartments with a view of the sea or surrounding landscape. Each is comfortably furnished and has a bathroom, fully-equipped kitchen, money safe, an individual balcony or veranda, TV and air-conditioning. Other features include a telephone, refrigerator and hot plate in the kitchen and baby cots upon request.